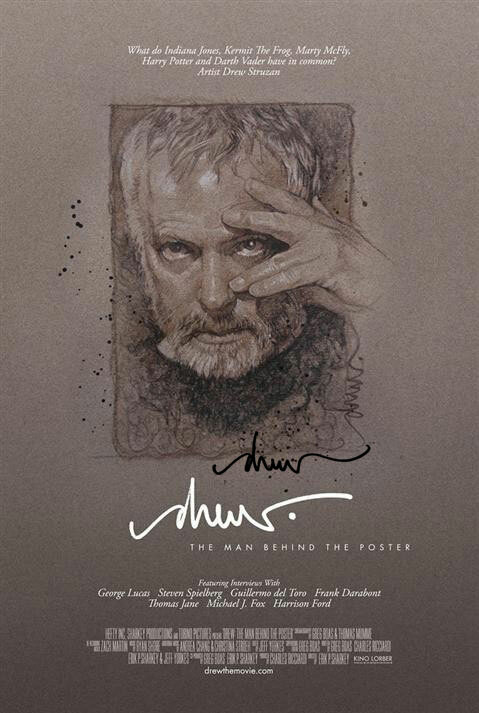 DREW: THE MAN BEHIND THE POSTER video interviews, plus win a signed Drew Struzan poster! Even if you don’t know the name Drew Struzan you almost certainly know his work. The renowned illustrator has provided art for the posters to popular movies like the BACK TO THE FUTURE trilogy, INDIANA JONES, STAR WARS, POLICE ACADEMY, and THE MUPPETS movies, to name but a few. He’s also someone I consider a personal hero. I’ve been an artist since I could hold a pencil, but as a kid I never took much interest in fine art hanging on museum walls – yet when I visited my local movie theater, I would spend considerable time studying Drew’s poster art as if it was some famous historical painting. 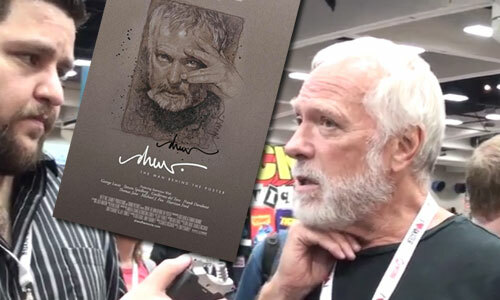 I first met Struzan about a decade ago at San Diego Comic-Con, and found him to be a humble and welcoming man, generous with his time and wisdom. Drew, unlike some in his position, was not the least bit pretentious or proud, though he certainly would have earned that right. The new documentary DREW: THE MAN BEHIND THE POSTER studies his life and career, delving into his beginnings, his many accomplishments, and even some of his numerous work-related frustrations. The film is a passion project for director Erik Sharkey, born out of his personal loss, but done with love and sincerity. Many who know Drew are aware he’s a rather private individual, so the fact he was willing to open his life to this production was and is a big deal. In the documentary you can hear testimony from many of Struzan’s famous admirers and subjects, including Harrison Ford, Michael J. Fox, Steve Guttenberg, Frank Darabont, Steven Spielberg, George Lucas, Thomas Jane, Sam Witwer and more. The film premiered at this year’s San Diego Comic-Con, and is playing at select Reading Cinema theaters – look for expansion info soon. While spending time with the project’s crew, I had the opportunity to interview Drew along with director Erik Sharkey and producer Charles Ricciardi. Watch all three of those interviews below, followed by the film’s trailer. Big thanks to Devin Pike and Jeni DeFeo for shooting these interviews. Contest is open to U.S. residents only, all entries must be received by August 31, 2013. For a full listing of where you can see the film, click here. 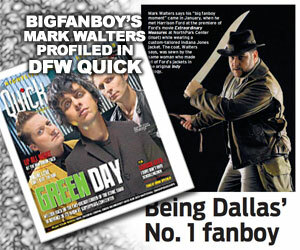 For our Dallas readers, it will be playing next at The Texas Theatre on August 23, 2013 – info on tickets here. Drew is the greatest! 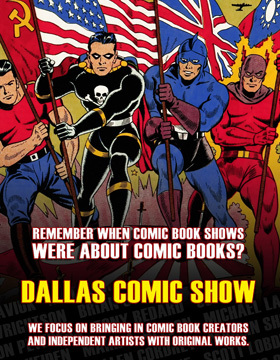 I really look forward to seeing this, but Dallas, being the closest venue, is still waaay, faaar away, like almost in another galaxy. 🙂 Guess I’ll have to see it later, but make no mistake…I will see it. Any options to entering other than having a ticket stub? At the moment no, but we may do a similar promotion when it hits home video. Tell your local movie theaters they need to play it!